Unemployment, corruption and the rise of the far-right. These are some of the main topics in the Andalusian election campaign … along with the Catalan independence push. 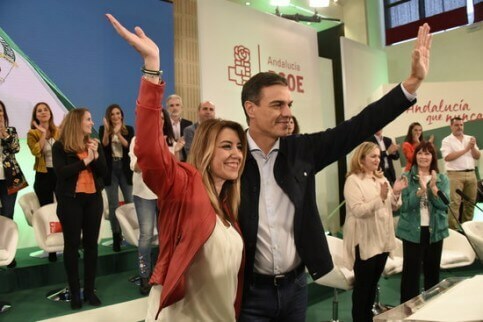 Ciudadanos (Cs) and the People’s Party (PP), two of the political forces standing in the vote, have made the relationship between Spain’s ruling Socialist (PSOE) party and the Catalan pro-independence government one of the main reasons to criticise the current Andalusian president, Susana Díaz, also Socialist. Díaz, herself traditionally highly critical on the pro-independence movement, is in this campaign facing criticism because her party in Madrid is taking a more moderate approach towards the Catalan government than its People’s Party predecessor. ‘I do not need to wrap myself in the Spanish flag, and less so to defend centralism,’ she said in a TV debate on Monday, fighting back at the criticism of the Socialists being in power with the support of pro-independence parties. During the debate, the Ciudadanos candidate, Juan Marín, said that the Socialists and left-wing Podemos ‘have left governance and public services in the hands of those who have carried out a coup against democracy’. The PP leader in Andalusia, Juanma Moreno, also used Catalonia to attack Susana Díaz. Whilst Díaz tends to avoid the Catalan debate, the candidate for Podemos, Teresa Rodríguez, has hit back several times at the parties willing to use Catalonia as an electoral weapon. ‘We are talking about Catalonia when we should be talking about fundamental rights. You are absolutely obsessed,’ she told the Ciudadanos candidate. Yet the presence of the Catalan debate goes further than the TV debate. Ciudadanos has launched a bus which is set to go through Andalusia with a picture of the former Catalan president and vice president, Carles Puigdemont and Oriol Junqueras, smiling. ‘They are laughing at Spain,’ says the motto accompanying the photo. Andalusians will decide their future on Sunday 2 December. Since the late 1970s, the Socialist party has been in power there uninterruptedly, having won all elections but one. In the last election they got the lowest share of the vote ever, and for the first time Podemos and Ciudadanos won seats in the Parliament. Although the Socialists are expected to come first – without an absolute majority and maybe with its worst results ever – Podemos and Ciudadanos are expected to consolidate and fight for second position along with the PP. One of the main highlights of the election might be the far-right Vox party entering the Andalusian Parliament, and therefore getting seats in a Spanish chamber for the first time ever. And what if they are decisive in enabling an unprecedented right-wing majority? Spain’s Ciudadanos leader, Albert Rivera, has not ruled out reaching an agreement with Vox. ‘If Ciudadanos wants to lead a government, it has to be open to hearing the conditions put forward by other groups,’ he said during a radio interview on Tuesday.